Book Description: We love to root for the underdog, and that’s part of why we’re drawn to the stories of revolutionaries. Whether they fail, succeed, or succeed only to become what they once fought against, people who can rally others to their cause and shake up the status quo tend to be inherently interesting. 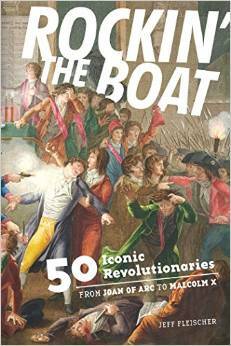 Rockin’ the Boat tells the stories of 50 such legends throughout the world, from people fed up with the Roman Empire and the revolutionaries who helped create America. Author bio: Jeff Fleischer is a Chicago-based journalist and author, who has written for dozens of national and international publications including Mother Jones, the Sydney Morning Herald, National Geographic Traveler, Mental Floss, and Chicago Magazine.